Medical carts are used in a variety of healthcare settings including operating rooms, hospital wards, and doctor’s clinics. Medical professionals in each of these places demand different things from their medical carts. Some need to store scalpels and syringes, others need to keep medications and bandages on hand, and others simply need a place to put leaflets and other informational material. 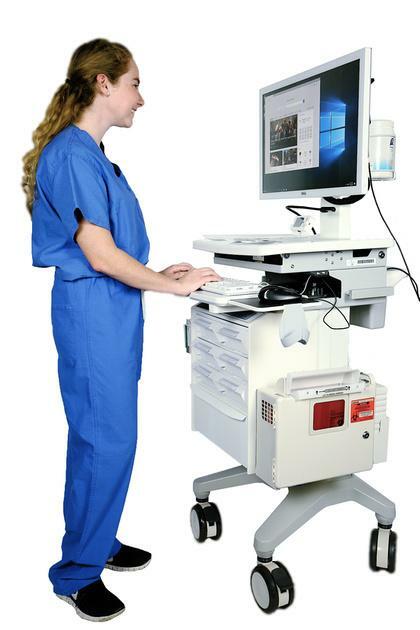 Consistently though, medical professionals need portability, storage capability, and customizability out of their medical carts, along with the capacity to house and transport computers. These features are essential for them to do their job efficiently and effectively, providing the best possible care to the highest number of patients. Scott-Clark Medical has recognized this need for a high quality, versatile, and portable medical cart and provided the solution: custom-made medical supply cabinets on wheels. Scott-Clark Medical is a custom medical cart manufacturer, identifying and providing for your employee’s individual needs. Our carts are user-friendly with height adjustability, reliable brakes, and smooth steering. They possess room for a computer keyboard and monitor as well as several drawers where professionals can store anything they might need. Multiple configurations are available, such as a sharps disposal bin or a barcode reader. 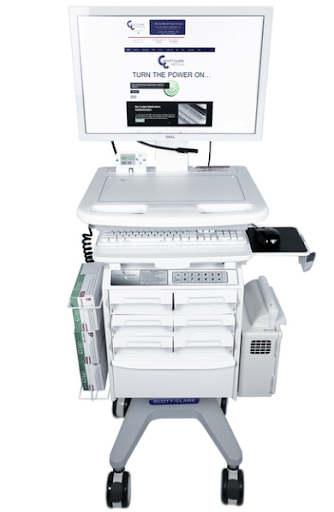 Additionally, Scott-Clark medical carts are reliably powered using lithium-ion batteries. These features enable your healthcare professionals to easily use the cart, keeping their focus on the patient and not on technical difficulties. Whether you are a large hospital or a small doctor’s office, your employees have specific, individual needs. We can provide you with a custom-made medical supply cabinet that addresses and fulfills those needs, making it easier for you to care for your patients well. Learn more about what the Scott-Clark Medical Team can do for you and contact us today.